In my previous post I talked about Stanton Street being an offshoot of the river that is Bowery. Above is a picture I took looking up Bowery from Stanton, during a warm June day when the current was calm. 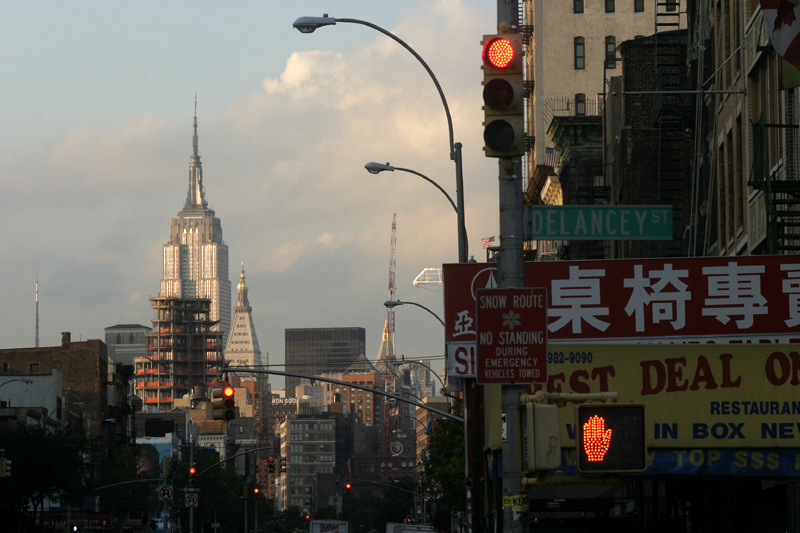 One of my favorite things about living on Stanton was this view up Bowery toward the Empire State Building. Like the World Trade Center was, the ESB is the perfect structure to look at from a distance in order to guage the haziness or crispness of any given day (clearly, the picture above was taken on a very humid day). 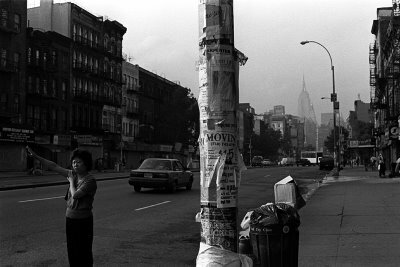 I miss this old view up Bowery. Because sometime in early 2004 or so, construction began on a luxury apartment tower at Astor Place, which is about 9 blocks uptown from Stanton. A garish-looking building just by itself, it doesn't block the view of the ESB from Bowery, but it definitely cuts into it. The two images below, taken in late 2004 and early 2008, are from the same intersection, 1st and Bowery, and clearly show the building's obtrusiveness as well as the alarming rate of ChaseBankWholeFoodsification Bowery has undergone. At right is a picture taken further south on Bowery, from Delancey. While Paul Goldberger derides the building as a green monster in his review in the New Yorker, I've more often heard it referred to as the spaceship that landed in the East Village. I actually don't mind the bulding as much when I'm looking downtown at it, from 11th Street or so. But how anybody let it cut into that classic vista up Bowery is beyond me. Take the old Met Life Tower on 23rd, for example. With its high-pitched roof and nighttime lighting, it plays off the ESB wonderfully (even though it predates the ESB by 20-some years). It seems to me the Astor Place tower could have been an incredible opportunity to do something similar. Unfortunately, it is way out of context. As Goldberger put it best, the building is "an elf prancing among men."